Take rice flour, besan, rava/suji, curd, mix it well and soak it for about 5-6 hours. 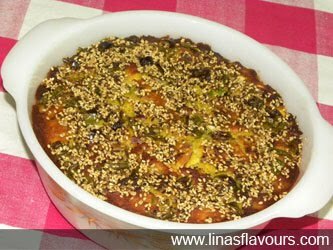 You can use ready made dhokla flour also. It is a traditional Gujarati recipe. Take batter, add all the vegetables, green chillies, ginger-garlic paste, salt, red chilly powder, turmeric powder, baking soda and mix it well. Make sure that batter is thick. Heat oil in a pan, add mustard seeds, cumin seeds, cloves, cinnamon, curry leaves, asafoetida and pour it on the batter. There are three ways to make handvo. If you are using traditional way of making handvo then grease handvo vessel with oil, add batter into it, pour tempered oil on it and cook it for about 40-45 minutes on a gas stove or till it turns light brown. If you are making it in microwave oven, then take microwave safe bowl, grease it with oil, pour batter into the bowl, pour tempered oil and bake it for 200 degree C for 35-40 minutes. To check it if it is done, insert the knife in it, if it comes out clean then it is done. You can even make small ones in the non-stick frying pan. Heat oil in frying pan, temper oil and pour small portion of batter. Close the lid and cook it for 5-7 minutes on each side. Serve it hot with green chutney, tomato ketchup or curd. Note: You can ferment dhokla flour for 5-6 hours or can make it instant also. Use 1/2 teaspoon baking soda more or can even use fruit salt.